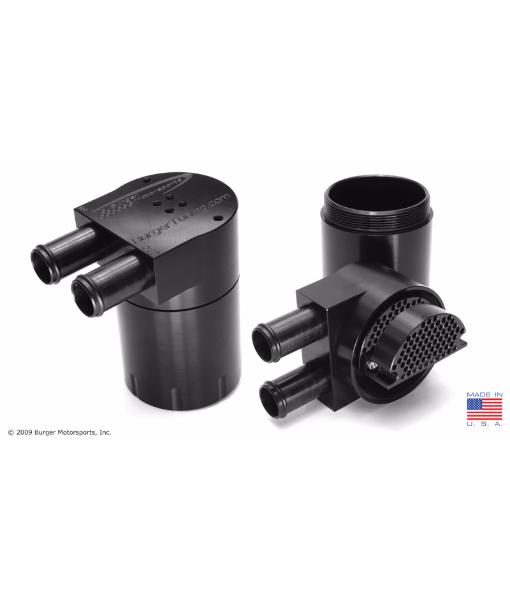 Avoid oil entering your air intake with this catch can from Burger Motorsports. It’s no secret that the Mk7 turbo motors can suffer from oil control problems causing oil to blow through and coat the intercooler and charge piping, gunking up intake valves and the VANOS system, lowering the effective octane, and generally degrading engine performance. The higher your boost levels the more apparent these problems become. The solution to this problem has finally arrived. The BMS oil catch can. While there are other catch cans on the market they all fall short in various areas. Some are mounted on the hot/turbo side of the motor preventing proper vapor condensation. Others utilize hoses that are too small and runs that are too long to allow proper PCV ventilation causing internal motor / ring sealing issues. Some have insufficient or no internal baffle system while others have internal baffles systems that are too restrictive. Some even bypass the PCV system all together venting crankcase gas and odor to atmosphere. Most are simply repackaged oil catch cans from smaller / lower power motors shoe horned in to place in the engine bay. To solve these problems BMS designed their oil catch can kit from the ground up specifically for the the turbo VW application. It features 100% CNC machining with zero welding for a precision fit and long life. The can itself is guaranteed for the life of the vehicle. 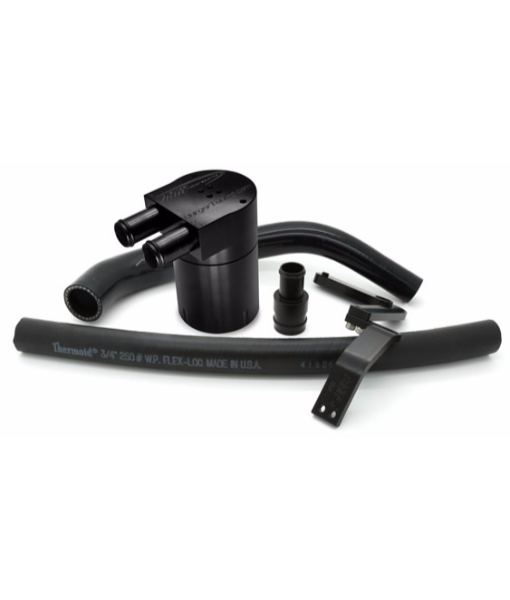 The hoses exceed the OEM PCV piping in diameter and that flow rate is maintained throughout the entire oil catch can ensuring no excessive crankcase pressure buildup. The BMS OCC retains the factory fully closed loop PCV operation preventing any PCV vapor from leaking to atmosphere. The mounting locations are selected to minimize the line length, allow more efficient operation, and retain a stealth look. Install takes around 20 minutes, includes all required hardware, and is 100% reversible. Simply unscrew the base of the can or use the drain plug to safely dispose of captured oil with the rest of your used motor oil during oil changes.